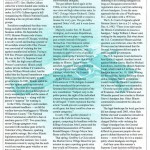 This article by Robert Loerzel originally appeared in Illinois Issues magazine’s November 2008 issue. Ever since the Founding Fathers wrote the Second Amendment, Americans have been arguing about what it means. Does it give every citizen the right to own guns? Or is it just about the need for a militia? Illinois has often been at the front line of the national battle over gun rights — and now it is once again. The National Rifle Association and the Illinois State Rifle Association are aiming to shoot down laws that prohibit handguns in Chicago and Oak Park. But gun-rights advocates in Illinois were ecstatic. “After 40 years of getting beat up, it felt good to be vindicated,” says Richard Pearson of Chatsworth, executive director of the Illinois State Rifle Association. On the same day that the Supreme Court announced its ruling, Pearson’s group joined with the Second Amendment Foundation and four Chicago residents in a federal lawsuit against Chicago. Now, the question is whether the Washington, D.C., ruling applies to state and local governments such as Chicago. McDonald, a 74-year-old retiree, says gang violence is getting worse in Morgan Park, the South Side neighborhood where he lives. McDonald says the gangs know he reports their activities to the police. “I hear them shooting all the time, and I call the police,” he says. Recently, some gang members stopped him as he was driving his truck. “I knew they had guns,” McDonald says. “They were cursing me and calling me ‘old graybeard.’ They said they could put me down.” McDonald fears that criminals may break into his home someday. “I want to be able to protect myself and my wife,” he says. The courts will now decide if the Second Amendment gives McDonald the right to keep a handgun in his house. In addition to McDonald’s case, the NRA filed separate lawsuits challenging handgun laws in Chicago, Oak Park, Morton Grove and Evanston. 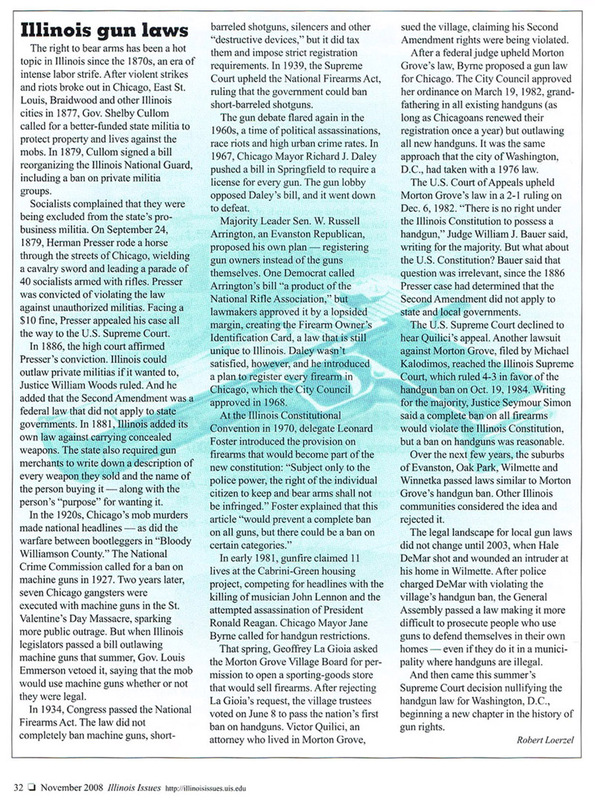 In 1981, Morton Grove became the nation’s first municipality to outlaw handguns. But this summer, facing the NRA lawsuit, the Morton Grove Village Board voted to repeal the ordinance. In retrospect, Village Administrator Joe Wade says the ban did not have much effect on safety in Morton Grove. “It was a quiet town before the ordinance, and a quiet town after the ordinance,” he says. 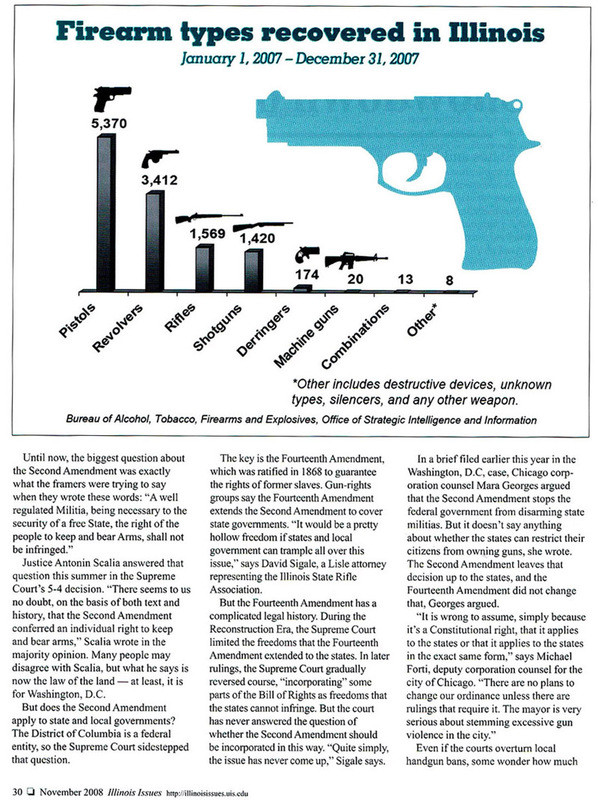 The NRA is dropping its case against Morton Grove, but what will happen with the Evanston case is less certain. Evanston amended its handgun ban, but it did not scrap the law altogether. Under the revised ordinance, “You can’t have a handgun except in the home for purposes of self-protection,” says Evanston Corporation Counsel Jack Siegel. That brings Evanston in line with the Supreme Court ruling, Siegel says, but the NRA still objects. Meanwhile, Chicago and Oak Park officials are defending their handgun bans in court. Justice Antonin Scalia answered that question this summer in the Supreme Court’s 5-4 Heller decision. “There seems to us no doubt, on the basis of both text and history, that the Second Amendment conferred an individual right to keep and bear arms,” Scalia wrote in the majority opinion. Many people disagree with Scalia, but what he says is now the law of the land — at least, it is for Washington, D.C. But does the Second Amendment apply to state and local governments? The District of Columbia is a federal entity, so the Supreme Court sidestepped that question. The key is the Fourteenth Amendment, which was ratified in 1868 to guarantee the rights of formers slaves. Gun-rights groups say the Fourteenth Amendment extends the Second Amendment to cover state governments. “It would be a pretty hollow freedom if states and local government can trample all over this issue,” says David Sigale, a Lisle attorney representing the Illinois State Rifle Association. But the Fourteenth Amendment has a complicated legal history. During the Reconstruction Era, the Supreme Court limited the freedoms that the Fourteenth Amendment extended to the states. In later rulings, the Supreme Court gradually reversed course, “incorporating” some parts of the Bill of Rights as freedoms that the states cannot infringe. But the court has never answered the question of whether the Second Amendment should be incorporated in this way. “Quite simply, the issue has never come up,” Sigale says. 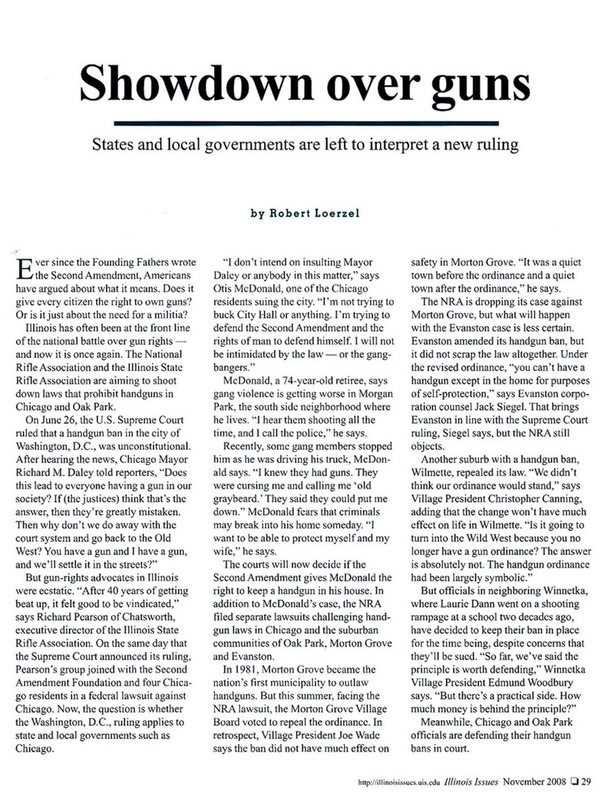 In a brief filed earlier this year in the Heller case, Chicago corporation counsel Mara Georges argued that the Second Amendment stops the federal government from disarming state militias. But it doesn’t say anything about whether the states can restrict their citizens from owning guns, she wrote. The Second Amendment leaves that decision up to the states, and the Fourteenth Amendment did not change that, Georges argued. Even if the courts overturn local handgun bans, some wonder how much difference it will make in crime rates. Steven Levitt, an economics professor at the University of Chicago and co-author of the best-selling book Freakonomics, found no link between gun laws and murder rates in a 2004 study. Crime dropped just about everywhere in the 1990s, regardless of what local gun laws were in place, and Chicago’s murder rate actually fell after averages had begun dropping in other cities, he noted. If the courts decide that the Second Amendment applies to the states, the next question is: Which gun laws are constitutional? Scalia ruled that D.C. residents have the right to defend themselves in their homes with handguns, but he also said there are limits on the right to bear arms. Would that description include semiautomatic assault weapons, which the federal government banned from 1994 until 2004? Cook County has a local ordinance banning assault weapons and high-capacity ammunition clips, which the Illinois State Rifle Association is challenging with another lawsuit. 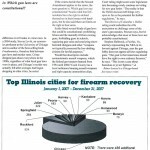 Tom Mannard, executive director of the Illinois Council Against Handgun Violence, says he believes that all of the gun laws in Illinois are constitutional, but he is concerned that the Supreme Court ruling might scare some legislators into becoming overly cautious on voting for new gun limits. “The reality is that the Heller decision left things very open as far as the potential for further regulations,” he says. The District of Columbia v. Heller ruling could embolden the rifle association to challenge some of the state’s gun statutes, Pearson says, but he acknowledges that most of those laws are probably constitutional. Postscript: In 2010, the U.S. Supreme Court ruled that Chicago’s ban on handguns was unconstitutional. The right to bear arms has been a hot topic in Illinois since the 1870s, an era of intense labor strife. After violent strikes and riots broke out in Chicago, East St. Louis, Braidwood and other Illinois cities in 1877, Gov. Shelby Cullom called for a better-funded state militia to protect property and lives against the mobs. In 1879, Cullom signed a bill reorganizing the Illinois National Guard, including a ban on private militia groups. Socialists complained that they were being excluded from the state’s pro-business militia. On September 24, 1879, Herman Presser rode a horse through the streets of Chicago, wielding a cavalry sword and leading a parade of 40 socialists armed with rifles. Presser was convicted of violating the law against unauthorized militias. Facing a $10 fine, Presser appealed his case all the way to the U.S. Supreme Court. In 1886, the high court affirmed Presser’s conviction. Illinois could outlaw private militias if it wanted to, Justice William Woods ruled. And he added that the Second Amendment was a federal law that did not apply to state governments. In 1881, Illinois added its own law against carrying concealed weapons. The state also required gun merchants to write down a description of every weapon they sold, and the name of the person buying it — along with the person’s “purpose” for wanting it. In the 1920s, Chicago’s mob murders made national headlines — as did the warfare between bootleggers in “Bloody” Williamson County. The National Crime Commission called for a ban on machine guns in 1927. Two years later, seven Chicago gangsters were executed with machine guns in the St. Valentine’s Day Massacre, sparking more public outrage. But when Illinois legislators passed a bill outlawing machine guns that summer, Gov. Louis Emmerson vetoed it, saying that the mob would use machine guns whether or not they were legal. In 1934, Congress passed the National Firearms Act. The law did not completely ban machine guns, short-barreled shotguns, silencers and other “destructive devices,” but it did tax them and impose strict registration requirements. In 1939, the Supreme Court upheld the National Firearms Act, ruling that the government could ban short-barreled shotguns. The gun debate flared again in the 1960s, a time of political assassinations, race riots and high urban crime rates. In 1967, Chicago Mayor Richard J. Daley pushed a bill in Springfield to require a license for every gun. The gun lobby opposed Daley’s bill, and it went down to defeat. Majority Leader Sen. W. Russell Arrington, an Evanston Republican, proposed his own plan — registering gun owners instead of the guns themselves. 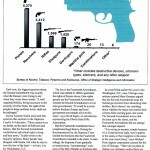 One Democrat called Arrington’s bill “a product of the National Rifle Association,” but lawmakers approved it by a lopsided margin, creating the Firearm Owner Identification card, a law that is still unique to Illinois. Daley wasn’t satisfied, however, and he introduced a plan to register every firearm in Chicago, which the City Council approved in 1968. In early 1981, gunfire claimed 11 lives at the Cabrini-Green public housing project, competing for headlines with the killing of John Lennon and the attempted assassination of President Ronald Reagan. Chicago Mayor Jane Byrne called for handgun restrictions. That spring, Geoffrey La Gioia asked the Morton Grove Village Board for permission to open a sporting-goods store that would sell firearms. After rejecting La Gioia’s request, the village trustees voted on June 8 to pass the nation’s first ban on handguns. Victor Quilici, an attorney who lived in Morton Grove, sued the village, claiming his Second Amendment rights were being violated. After a federal judge upheld Morton Grove’s law, Byrne proposed a gun law for Chicago. The City Council approved her ordinance on March 19, 1982, grandfathering in all existing handguns (as long as Chicagoans renewed their registration once a year), but outlawing all new handguns. It was the same approach that the city of Washington, D.C., had taken with a 1976 law. The U.S. Court of Appeals upheld Morton Grove’s law in a 2-1 ruling on Dec. 6, 1982. “There is no right under the Illinois Constitution to possess a handgun,” Judge William J. Bauer said, writing for the majority. But what about the U.S. Constitution? Bauer said that question was irrelevant, since the 1886 Presser case had determined that the Second Amendment did not apply to state and local governments. The U.S. Supreme Court declined to hear Quilici’s appeal. Another lawsuit against Morton Grove, filed by Michael Kalodimos, reached the Illinois Supreme Court, which ruled 4-3 in favor of the handgun ban on Oct. 19, 1984. Writing for the majority, Justice Seymour Simon said a complete ban on all firearms would violate the Illinois Constitution, but a ban on handguns was reasonable. 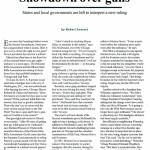 Over the next few years, the suburbs of Evanston, Oak Park, Wilmette and Winnetka passed laws similar to Morton Grove’s handgun ban. Other Illinois communities considered the idea and rejected it. 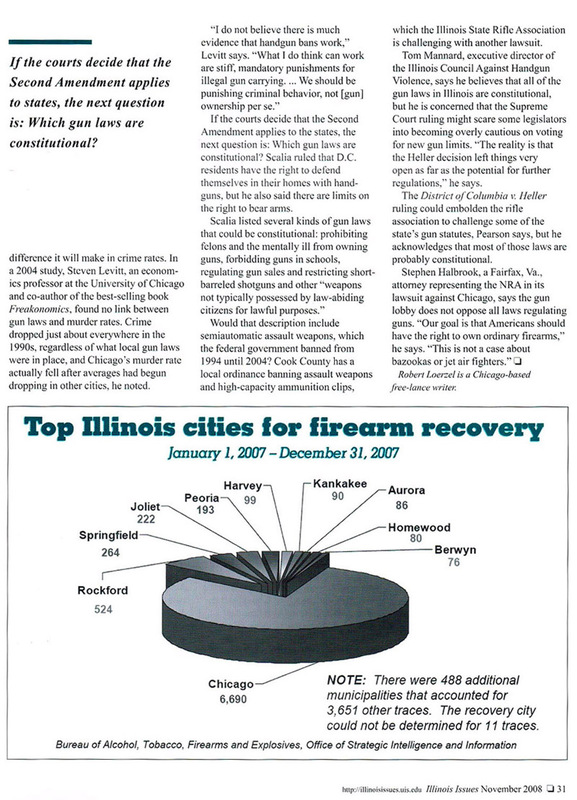 The legal landscape for local gun laws did not change until 2003, when Hale DeMar shot and wounded an intruder at his home in Wilmette. After police charged DeMar with violating the village’s handgun ban, the General Assembly passed a law making it more difficult to prosecute people who use guns to defend themselves in their own homes — even if they do it in a municipality where handguns are illegal. And then came this summer’s Supreme Court decision nullifying the handgun law for Washington, D.C., beginning a new chapter in the history of gun rights.